An editor who loves smartwatches, fitness trackers, and other wearable smart devices. When it comes to activity trackers, Fitbit reigns supreme. Not only does the brand boast an impressive 24.5% of the wearable market share and enviable name recognition, but it also offers an extensive lineup of devices, with options for beginners who only want to track the basics and picks for more advanced athletes who want all the stats they can get. True, Fitbit will never compete with the Garmins of the world when it comes to producing activity trackers that offer the most comprehensive feature sets possible, but for most consumers, Fitbit products' functionality will more than cover the bases; the higher-end models even include things like built-in GPS and heart rate tracking. Speaking of heart rate tracking, that's where the Fitbit Charge 2 comes in. This recently released tracker replaces the Charge HR in the brand's device lineup, and like its predecessor, it features PurePulse heart rate-tracking technology to keep you abreast of your beats per minute. It's currently available on the Fitbit website for $149.95 and up, and we recently took the device for a test run (well, in our case, it was more like a test elliptical). Keep reading for the lowdown on Charge 2's features, including all the pros and cons. 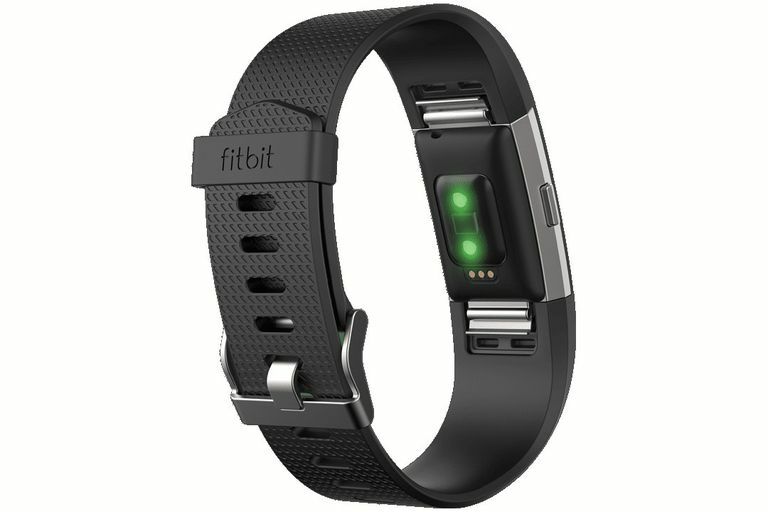 So, instead of a thinnish band as seen on the Fitbit Alta, the Fitbit Charge 2 sports a substantial band. It's on the thick side, but it does allow for a large OLED display (bigger than what was found on the original Charge HR) that shows your current activity stats, incoming alerts and more. The textured, interchangeable strap is made of a rubberized "elastomer material" available in five colors (black, blue, plum, teal and lavender), all of which include a silver chassis. For $30 more (so for a total price of $179.95), you can choose from one of two "special edition" Charge 2 options: lavender/rose gold or black/gunmetal (the latter color refers to the chassis). You can also purchase a leather band in one of three colors (brown, blush pink or indigo) for $69.95. Since the straps are interchangeable, you can definitely pick a few and swap them out depending on your mood. We got the Charge 2 in a size small (large and XL are also available) and in the teal shade. It might be a nitpick, but we did notice that in some photos on the Fitbit website, this color looks a bit lighter than it is in reality. Not a big deal, but just something to note if you were expecting a pastel-ish hue. The Charge 2 felt a bit bulky on our smallish wrist — not enough to really bother me during the day, but we didn't find it comfortable enough to wear to bed. This meant we missed out on the auto sleep-tracking functionality, which logs how long you're at rest in addition to the quality of your sleep. We couldn't leverage the smart alarm, which vibrates on the band to silently wake you up, either. Since the PurePulse heart rate-monitoring feature is the main attraction here, this functionality gets its own section. With a sensor on the inside of the device (under the display), the Charge 2 continuously measures your beats per minute. Unless you're an avid athlete who uses heart rate info for things like marathon training, this number might not mean much to you on its own. This is where the Fitbit app comes in; clicking on the heart rate section (indicated with, naturally, a heart) will bring you to a chart that tracks your resting heart rate over time. Scroll to the right and you'll see that Fitbit uses your heart rate info to assign you a "cardio fitness score." This number is meant to give an idea of your fitness level compared to other people of your age and gender, and it's assigned based on your resting heart rate and the info you provide in your Fitbit profile. The scores break down into six tiers, from poor to excellent. We were surprised to see that our score was in the "good to very good range" — our father the exercise nut would be ashamed, but to us that's not bad at all considering we sit in front of a computer all day and sometimes "forget" to work out for weeks at a time! We found this to be the most motivating aspect of the Charge 2 — more than the reminders to move — since we want to see our score jump to the "excellent" level. It can also be useful to view how your workouts break down in terms of what heart rate zone you're in. Walking will generally fall into the lower-intensity "fat burn" zone, while more vigorous workouts will take you into the "cardio" or "peak" zones. Of course, you can also just tap the Charge 2's display to view your current heart rate — it's interesting to see how it fluctuates throughout the day. You can see which zone you're in at any time simply by tapping on the screen — not that if you are 50% below your maximum heart rate, you won't see anything but a heart; the other zones have specific symbols, all of which are delineated in the user's manual. My workout of choice is using the elliptical machine in the gym, and Charge 2 has a mode specifically for this activity. Other options include running, biking, interval workout, weights, treadmill or the very general "workout." Another standout feature on the Charge 2 is the "Relax" function for guided breathing exercises. Pressing the hardware button on the side of the tracker will eventually bring you to this feature, and you can tap the OLED display to toggle between the 2-minute and 5-minute options. The breathing session is apparently based on your real-time heart rate, and it instructs you exactly when to inhale and exhale. We're a fan of the 2-minute option; it helped us take a step back during busy days and become more mindful of my body, and we ended up feeling calmer at the end of the session. It's not a ground-breaking feature, but it is a nice little addition to this update to the Charge HR! While the Charge 2 displays notifications from your phone when the two devices are connected via Bluetooth, it doesn't really add much to the experience. You can only see incoming calls, texts and calendar events on your wrist, and you can't respond to them or anything. If you're interested in robust at-a-glance notifications, the Fitbit Blaze or a straight-up smartwatch would be a better fit. This activity tracker includes more features than are fit to print, so make sure to check out the user's guide to make sure you're getting the most out of the device. We highlighted the new functionality, though, so there shouldn't be any surprises on this front. The Charge 2 is rated for up to 5 days of use on a charge, and in my experience, it could easily go three days before needing to be tethered to the cable again. We tend to get nervous any time we see a battery life indicator dip below half-full, so we never let the tracker run till it died before plugging it in again. The Fitbit Charge 2 is a definite improvement over the original Charge HR thanks to new features like the cardio fitness score and the Relax guided breathing sessions. It's on the thick side, but it does allow for a large OLED display (bigger than what was found on the original Charge HR) that shows your current activity stats, incoming alerts and more. It's on the thick side, but it does allow for a large OLED display (bigger than what was found on the original Charge HR) that shows your current activity stats, incoming alerts and more. Long battery life and a smartphone app with comprehensive activity stats and analysis sweeten the deal. Starting at $149.95 and up (as of publication), the Charge HR isn't cheap, but it's certainly not unreasonably priced, either. Its functionality should satisfy most exercise enthusiasts who want to know more about how hard they're working, but don't care about more advanced features like GPS tracking. And while it's not exactly stylish, the band is relatively comfortable, and at the very least it's an inoffensive, sporty design. What we think: This is a great tracker if you're looking for more stats than what you'll find on most entry-level bands, and features like the cardio fitness score actually make it fun to use.